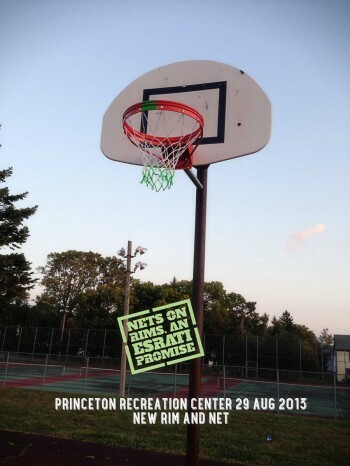 Last night, full court basketball returned to Princeton Recreation Center. A brand new First Team FT172D rim was installed by me and my friend/client and supporter- Rob Degenhart, who brought his super-duper 20v drill along. Had we had his super-duper 20v cut off tool, we could have hung the second rim. That will happen this weekend. These are the first two rims to arrive, and they were donated by Kevin Busarow of Oberwerk a local Dayton business that sells precision high powered binoculars. We had help from the players on the court- from hanging the net to trying to break the rusted bolts (with no luck). We tried to give away a t-shirt for three threes, but no one was hitting last night. Rob took this video of the first dunk. Here’s to many more. If you want to buy a rim, or a cutoff tool or drill to add to the campaign as an inkind donation, have them sent to Elect Esrati, 100 Bonner St. Dayton OH 45410. Please check with david@electesrati.com or call 937-985-1312 before sending the power tools- we only need one set. The rims- as many as you buy- we will hang.